Weber Ash Catcher Assembly for 22-1/2" One Touch Grills. Components include ash catcher bowl, ring, and handle. Replaces Weber Part # 63093. Ring diameter is approx. 10-1/8". Ring Depth Approx. 3-3/4". Bowl diameter approx. 9-3/4". Bowl depth approx. 4-1/2". Made for 2015 model grills, but is compatible with all older models as well. Handle Weber Part # 63038. Bowl Weber Part # 85531. Please visit Weber's website at http://help.weber.com/schematics/#serial-number to ensure you order the correct parts for the specific year of your grill model. Parts can appear to be identical but not fit certain year models. It is best to look up by serial number. The link will also help you find the alpha-numeric serial number. 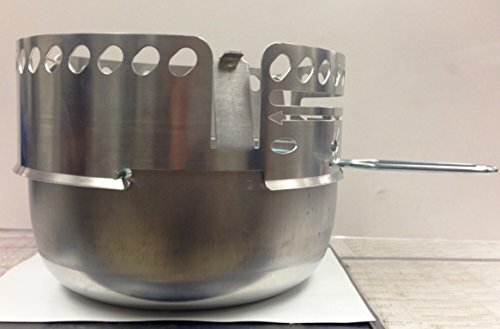 Weber part # 65143 Ash Catcher Assy for 2015, 22.5" One-Touch Grill - Replaces Weber Part # 63093. Made for 2015 model grills but is compatible with all older models as well. Ring diameter is approx. 10-1/8"; Ring depth approx. 3-3/4"; Bowl diameter approx. 9-3/4". Bowl depth approx. 4-1/2". Please visit Weber's website at http://help.weber.com/schematics/#serial-number to ensure you order the correct parts for the specific year of your grill model. Parts can appear to be identical but not fit certain year models. It is best to look up by serial number. The link will also help you find the alpha-numeric serial number.